Jane Tirrell alerted me to a population of this species currently blooming (late February/early March) along the Burkhart Trail on the way from the Devil's Punchbowl about 2-1/2 miles toward Burkhart Saddle. The Devil's Punchbowl is in a transition zone between the north-facing flanks of the San Gabriels and the desert floor of the Mojave. These plants, which had been previously referred to as Claytonia lanceolata, have been recently described by Claytonia authority Tommy Stoughton as Claytonia peirsonii ssp. peirsonii. When I saw them I was troubled by their obvious dissimilarity to the species description and the illustration for C. lanceolata that was in the Jepson Manual. Claytonia lanceolata is a taxon which is not uncommon further to the north and extending into Canada, and other western states, but Claytonia peirsonii ssp. 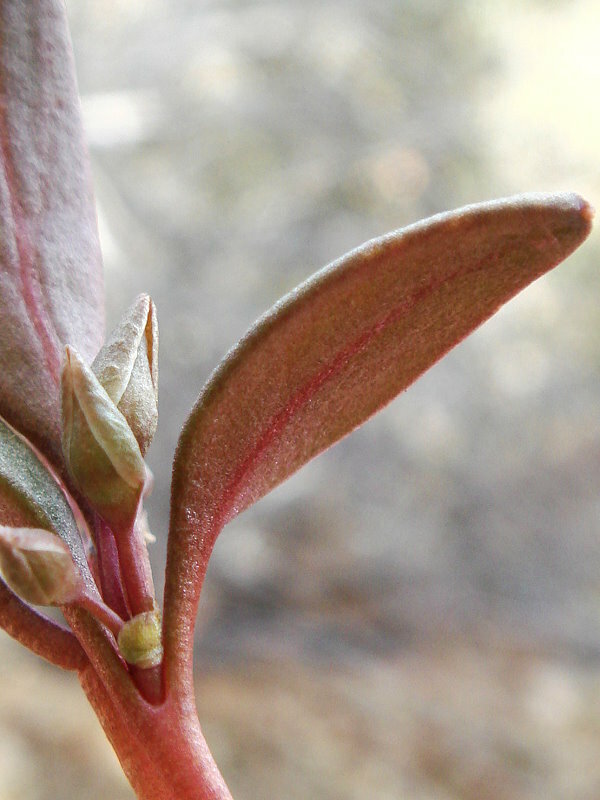 peirsonii is a San Gabriels endemic, having been found there in the Mt. Baldy and Devil's Punchbowl areas, and near Windy Gap and Winston Ridge. Tommy Stoughton has identified three other subspecies of C. peirsonii, ssp. bernardinus and ssp. californacis in the San Bernardinos, and ssp. yorkii in the southern Sierra Nevadas. 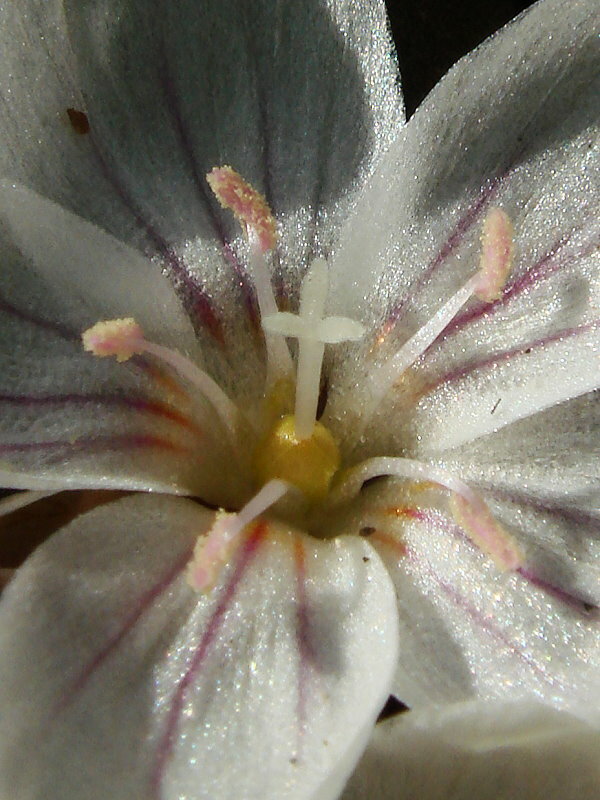 His dissertation, entitled Evolution and Systematics of Claytonia lanceolata sensu lato, which is awaiting publication, is available for viewing here, and he has given me permission to share it with anyone who is interested. Claytonia is named for John Clayton (1694?-1773/1774), Clerk to the County Court of Gloucester County, Virginia from 1720 until his death, one of the earliest collectors of plant specimens in that state, and described as the greatest American botanist of his day, who supplied materials for an 18th century flora of Virginia called Flora Virginica (published 1739-1743) by J.F. Gronovius. He conscienciously and systematically took samples of everything he encountered, and sent them to Mark Catesby at Oxford, who in turn sent them to Gronovius in Leiden, Holland, where they were examined by Linnaeus. He was also the Attorney General for the colony of Virginia. He did not publish much himself but his specimens were of considerable taxonomic and nomenclatural significance, and Gronovius based his work at least in part on a manuscript by Clayton. Since his were some of the first North American specimens studied by Linnaeus, many were type specimens for Linnaean names. The specimens that were studied by Gronovius were bought by Sir Joseph Banks and subsequently passed to the British Museum (now the Natural History Museum) in London, where they have recently (1988-1990) been separated from the main collection and curated as the Clayton collection. 1686 has often been given as his date of birth rather than 1694, but this is the date used by the John Clayton Herbarium of the Natural History Museum of London. All of the other Claytonia taxa in Southern California are annuals, but peirsonii is a perennial. The Jepson Manual gave May to July as the blooming period for C. lanceolata, which was another thing that bothered me since the plants near the Punchbowl were blooming in late February and early March. This now makes sense inasmuch as those plants are not C. lanceolata. Photo on right shows sepals generally purplish to brownish in bud. Photo on left shows the brown tuberous root structure that the plant grows from. Peirsonii is one of the California Claytonias that have such a tuberous root, the others being umbellata, obovata (not in the Jepson Manual but according to Tommy a valid taxon), and the newly named panamintensis T.R. Stoughton and serpenticola T.R. Stoughton. Cauline leaves generally reddish/purplish on abaxial surfaces due to betalain pigmentation. with leaves that are much more linear than ours. Copyright @ 2017 by Michael L. Charters.